With the episode entitled “Hi Diddle Riddle, Smack in the Middle” – with Frank Gorshin as the villain “The Riddler” – the show was beamed into American living rooms in living color, during an age when only three networks had programming. It immediately became a sensation, and aired twice-a-week in the first two seasons, “same Bat-Time, same Bat-Channel.” It spawned a revival for the character of Batman, and actually helped to create the Dark Knight. The show’s silly humor so altered the heroic character, that DC Comics took him to the dark side later in the decade. 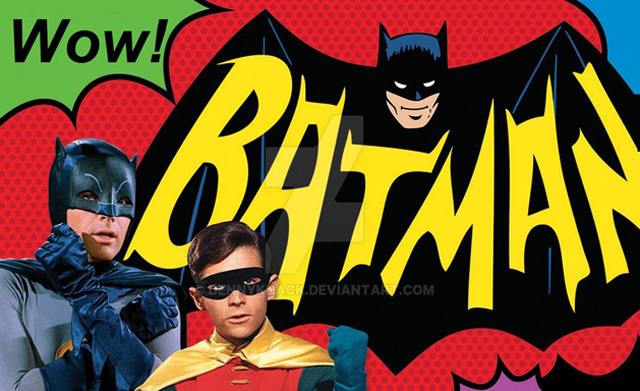 The two actors who portrayed Batman and Robin – Adam West and Burt Ward – have become cult phenomenons on their own, with many references to their heroics over the years from their fans in show business. HollywoodChicago.com photographer Joe Arce took this 50th Anniversary picture of the Dynamic Duo at the Hollywood Show in May of 2015. Batman and Robin LIVES! “Batman: The Complete Television Series” is available on Blu-ray, DVD and Digital Download through Warner Home Video. See listings for digital providers or video retailers for details. CLICK HERE for the 10 Best Films of 2015 by Patrick McDonald of HollywoodChicago.com.